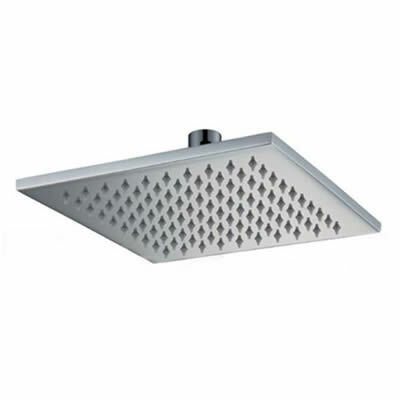 The Cube Shower Head is a popular choice of builders, designers and savvy home renovators alike. It features a modern geometric design and is incredibly trendy to look at. It can easily be installed in any bathroom, both in renovations and new home installations. With a contemporary shiny chrome finish, The Cube Shower Head is very elegant in design. Moreover, the shower head of this unit covers a large area, allowing for more relaxing and comfortable showers. Make no mistake; the Cube Shower Head is designed to redefine the experience of bathing. It is also highly efficient. It is a Watermark and WELS approved product with a 3 star rating. Furthermore, it has a water consumption rate of 8 litres per minute. The Cube Shower Head is a high-quality product that is designed to last several years of regular bathroom usage. So, don’t delay. Enhance the looks and utility of your bathroom by installing the Cube Shower Head. Purchase yours today for a great price from us at Ross’s Discount Home Centre in Perth.